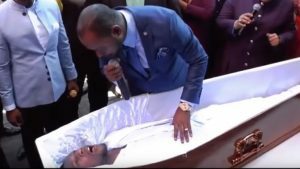 The employer of 29-year-old Brighton Moyo, who is seen in a controversial video purportedly being brought back to life by Pastor Alph Lukau of Alleluia International Ministries, says he has absconded from work for almost two weeks. Moyo, who works as a machinist at a door manufacturing company in Pretoria, was due to report for duty on Monday last week after a one week suspension but he never pitched. Owner of the company, Vincent Amoretti, says Moyo may be able to keep his job if he has a valid reason for not turning up for duty. The post “Resurrected” man a no show at work appeared first on SABC News – Breaking news, special reports, world, business, sport coverage of all South African current events. Africa's news leader..